As the Canadian women’s hockey team gears up for the 2018 Olympic Winter Games in Pyeongchang, South Korea, one player has made history before even stepping onto the ice. 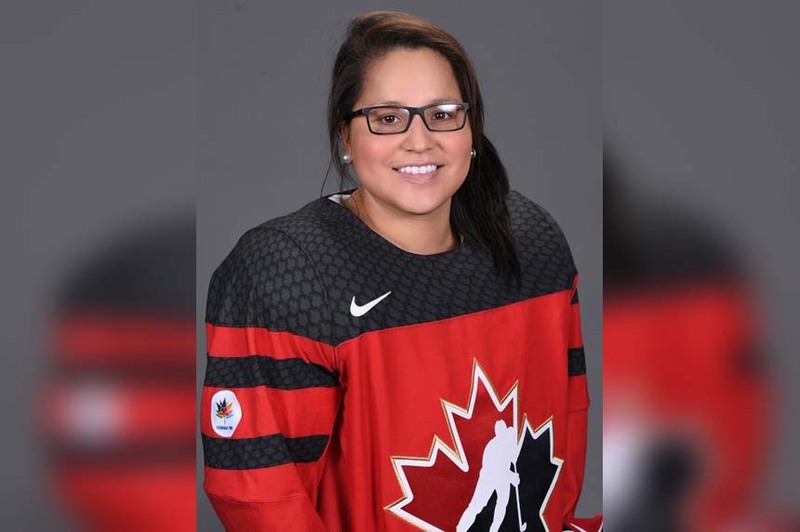 Defenceman Brigette Lacquette is the first-ever First Nations woman to make the team, and she’s been basking in an outpouring of well-wishes from across the country ever since she cracked the roster. “I’m super excited and I think having all that extra support from all the First Nations across Canada is definitely very special for me,” she said Tuesday during a national media call. Lacquette is originally from the Cote First Nation near Kamsack, Sask., but moved with her family to the small community of Mallard, Man. that she now calls home. Growing up, Lacquette said seeing fellow First Nations Manitoban Jordin Tootoo skate in the 2003 World Juniors was a moment that made her believe she could make it to the world’s biggest stage. Now, she said she hopes her play in Pyeongchang sends a message to the next wave of little girls imagining themselves wearing the Maple Leaf. “You can achieve anything you put your mind to. It doesn’t matter where you come from. You can always achieve your dreams,” she said. After being a late cut ahead of the 2014 games in Sochi, Russia, she said it was a thrill to get to call her Dad this year and tell him his hours of coaching and building a backyard rink for her every winter had paid off. Lacquette and the rest of Team Canada will be looking for their fifth-consecutive gold medal in women’s hockey when the Winter Games kick off Feb. 9. The team nicknamed “Smile Japan” is a close-knit group. Of the 23 players on the roster, 21 have been on the squad that earned promotion to the 2019 IIHF Ice Hockey Women’s World Championship last spring and 20 players were on the team that won the Final Olympic Qualification tournament on home ice in Tomakomai one year ago to earn the ticket to the PyeongChang 2018 Olympics. Despite being among the regular Women’s World Championship participants, Japan was missing in the Olympic women’s ice hockey line-up in 2002, 2006 and 2010 and for the first time earned qualification on the ice for Sochi 2014 and the second time for PyeongChang 2018. 15 of the players on the current roster were also part of the last Olympic squad four years ago. All 23 players have been playing their club hockey in the Japanese championship recently although a few players have overseas experience. Canada-born defender Akane Hosoyamada played NCAA hockey for the Syracuse University and a few CWHL games for the Calgary Inferno before moving to Japan. Goaltender Nana Fujimoto also has overseas experience minding the net for the NWHL’s New York Riveters in 2015/2016 while defenders Sena Suzuki (Toronto Furies) and Aina Takeuchi (Calgary Inferno) played in the CWHL before coming back to Japan for the Olympic season. Forward Miho Shishiuchi played in the Finnish women’s league for HPK Hameenlinna from 2014 to 2016. Takeshi Yamanaka, who played at the Olympic men’s ice hockey tournament on home ice in Nagano 1998, is in his second season as head coach of the women’s national team. He originally joined the team as an assistant coach after the 2014 Olympics. Chiho Osawa has been the team captain during the last few years. With 70 national team games in IIHF-sanctioned events 35-year-old forward Hanae Kubo is the most experienced players. She had her debut at the 1999 Women’s World Championship B-Pool. Shoko Ono, 36, debuted in the same year and came back in 2016 after a seven-year absence on the national team. 17-year-old defender Aoi Shiga is the youngest player on the team.